There isn't anything better than putting on your favorite song and dancing with your best friend. 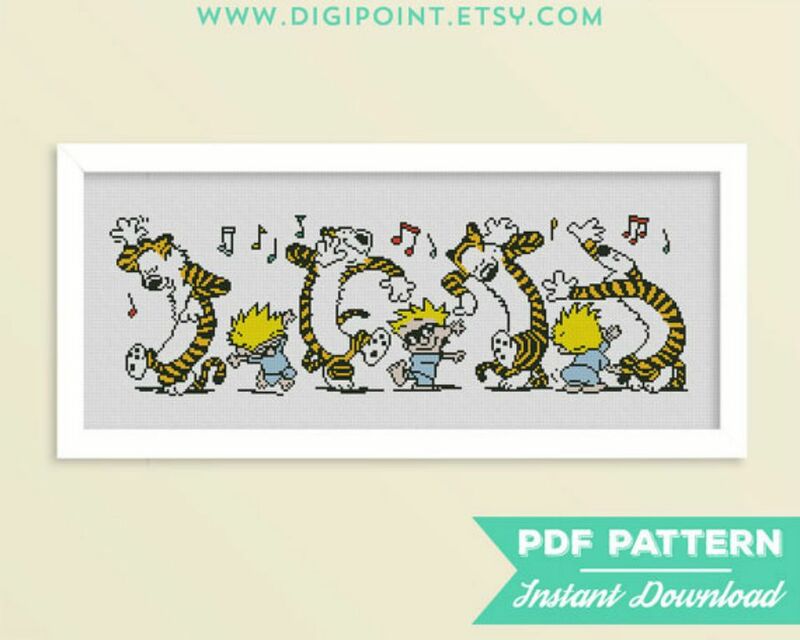 This pattern celebrates that wonderful friendship between a boy, Calvin and his tiger, Hobbes. These two characters are mischievous yet sweet. They have delighted kids of all for decades. Stitch this pattern up for your best friend as a special way to say, "I love you!" 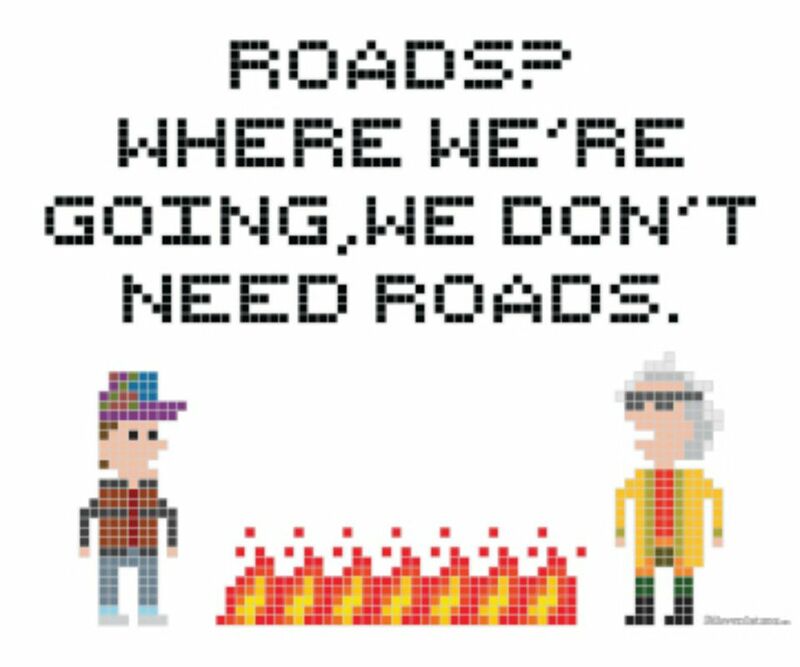 Back to the Future is a classic. We have watched Marty and Doc go on many adventures through space. This fun pattern celebrating the 80s film is free. This project is a quick and simple cross stitch that is perfect for both beginners and more advanced stitchers. You can stitch it up while you wait for the hoverboard you were promised. This pattern does not give specific details; you must rely on your keen sense of color and stitching skills to complete the project. Lloyd Dobler is the ultimate boyfriend. The swoon worthy guy from the movie Say Anything is still just as popular today as he was when the movie first came out. His love is true, his word is gold and his sense of style is beyond hip. Plastic Little Covers shares the love for Lloyd with their pattern of his iconic stance. This pattern is a must for any fan of romcoms. Stitch it up for your sweetheart. Everyone knows the story of Little Red Riding Hood and the Big Bad Wolf. She tracks her way to granny's and, with a little help from some friends, saves the day. Un Jour Grille shares her pattern for Red Riding Hood for free on her blog. This pattern and the instructions are in French, but can easily be translated. The final project would make an adorable pin cushion or small wall hanging for a library or child's room. The Disney show Gravity Falls took the world by storm. Although the show ended, the characters are still popular in modern culture. There are fan clubs, books and artwork showcasing Dipper, Mabel and the rest of the Mystery Shack gang. Little Room in the Attic created this pixel pattern to celebrate the success of the characters and the show. This project is a great gift for that quirky friend who loves a good mystery. Spongebob Squarepants has laughed his way into our hearts. His upbeat attitude, along with his ridiculous squarepants, have been delighting kids of all ages for years. Gvello Stitch shares this happy sponge for free on their website. This is the perfect accessory for any office cube, kid's room or playroom. It will brighten up anyone's day and bring a smile to their face. Disney's Tangled won over the hearts of fans of all ages. Rapunzel and her charming sidekick shared so many adventures; like the one pictured in this intricate Thomas Kinkade inspired pattern from 123 Stitch. There are so many details to this piece and it will definitely require a certain skill set and some time, but the effort is worth the hard work. This is a wonderful addition to any Disney or Thomas Kinkade collection. The villains of Dr. Who are almost as loved and revered as the doctor himself (or herself!). The Cybermen have been chasing the doctor for decades and yet still he fights them off and saves the world. Hancock House of Happy shares this pattern for free on their website. This project is a must for any fan of the show. For an added personal touch, stitch a phrase from this villain or your favorite doctor. There are no greater iconic characters than those of Star Wars. You can take your pick from the good guys or the bad guys. Jennrbee Stitches offers her version of these characters in a very detailed cross stitch pattern. Fans of the franchise in general, and the characters such as Luke, Leia and Darth Vader in particular, will love to have this pattern as part of their ongoing collection. Mickey Mouse needs no introduction. People all around the world know this peppy mouse's face. He has been entertaining generations of loyal fans. Even though his image has evolved over the years, people still adore and love him. Cross Stitch Fan shares their version of this famous mouse for free on their website. This pattern would look great on a backpack, jacket or a baby's quilt.